A book that will leave you sleepy, but a podcast episode that will leave you … in stitches, it’s Robin Cook’s quasi-classic Coma, a medical thriller more frightening than anything except a hospital bill. A thick slice of 70s anxiety, where women in the workplace crash up against the commodification of, uh, organ “donations” and the frustrations of laws presuming to encroach upon the sure natural rights of innovators to innovate, this little tome is yet another data point illustrating Clsn’s thesis that It Is Never Not the Seventies. There’s even a hacking scene! And probably the best last line we have ever seen a protagonist have in one of our books—and if you want to hear about those two things, keep an eye on our public Patreon feed, because we didn’t talk about them on the main episode, but there may well be some extras coming down the pike for you, absolutely free. 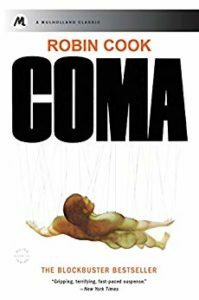 Laughter is the best medicine, so no matter how you’re feeling, you owe it to your future to just wail on that DOWNLOAD button and get healthy the old-fashioned way: by laughing at Coma.